matthew, a photo by james veltmeyer on Flickr. 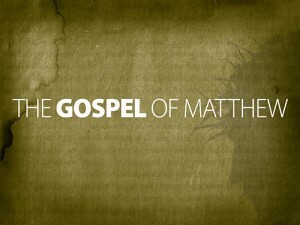 At youth group this term we are looking at the book of Matthew. I think we live in a post Biblical society. If you say Jesus walked on the water, people say, Who? Did what? So in first term we look at one of the gospels. # That young people will turn to Jesus and put their trust in him. # That leaders will prepare well and grow in their walk. # That a link will be made between youth group and our 6pm service.